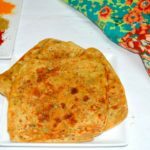 A flat bread made using whole wheat flour, which is cushiony as well as crisp and goes well with many Indian gravies and a sure hit with dals, is tandoori roti. 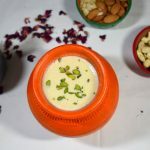 Traditionally and conventionally it is prepared in a tandoor i.e. a clay oven. But with the changing technology, such stuff is disappearing from the kitchens. 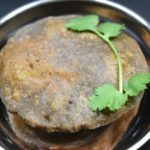 However to ensure that tandoori rotis do not disappear from our plates here is a recipe, rather a technique using which you will be able to make tandoori roti at home without a tandoor. 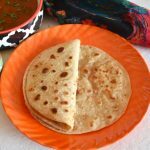 The best part about this roti is that you do not need any special dough or ingredients for it. 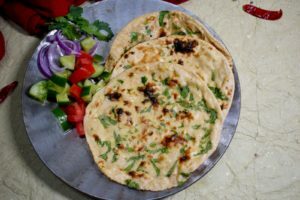 While making chapatis if you feel it is too monotonous, take a break and make this easy and simple tandoori roti on tawa. 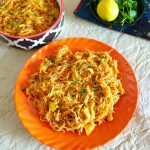 This tandoori recipe is not about the ingredients, it is about the technique. The regular chapati dough is to be used. 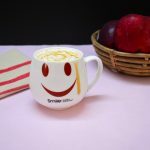 Make sure it is soft. You might also add a little salt in it while kneading, if you don’t generally, for tandoori roti. A non-stick pan or skillet or griddle is a big no-no! Use a heavy bottom iron tawa for the best results. 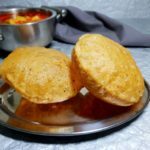 Another interesting roti recipe is the missi roti. It is a healthier chapati. View the recipe here. 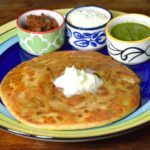 A bread that I often make without any extra or special efforts is the Masala Paratha. It really peps up the entire menu. View the recipe here. 1. Take a portion of chapati dough. Use 1 & ½ times of the regular chapati dough. Shape them into a ball. Flatten slightly. 2. Hold the dough ball from the bottom and dip the top in a bowl filled with water. 3. Thereafter press it against the chopped leaves of coriander. Basically, we are trying to incorporate chopped coriander leaves. 4. Dust with some flour. Press lightly. 5. 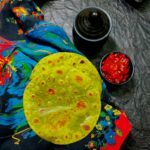 Roll into a thick chapati. Meanwhile, heat a thick skillet. 6. Flip in and apply water on the other side. 7. Put it on HOT skillet. 8. Press to ensure it sticks well and the bubbles are also suppressed. Cook for a minute. 9. Flip the skillet and cook on the direct flame. 10. Cook till nice brown spots appear. 11. Remove from the skillet, grease with little oil or butter. You can slightly crush the sides. 3. Thereafter press it against the chopped leaves of coriander. 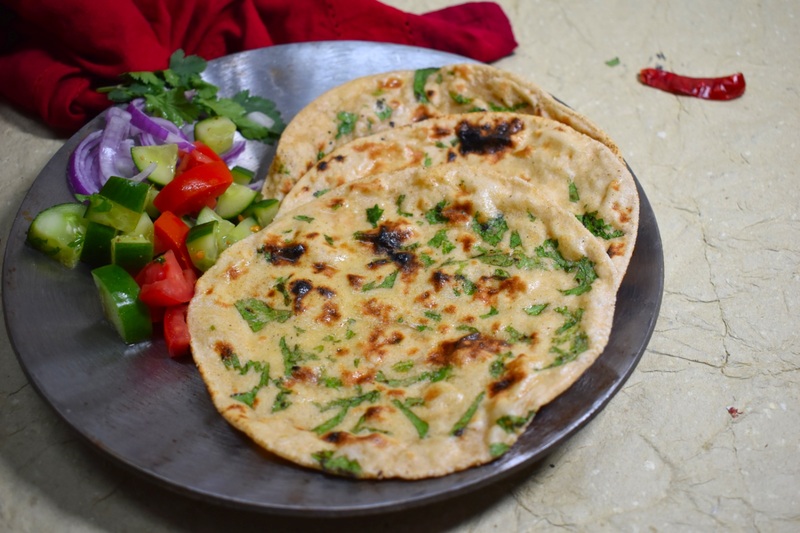 Basically we are trying to incorporate chopped coriander leaves in our tandoori roti. 4. Dust with some flour. 9. Flip the skillet and cook on flame.